The ability to afford ammo for our arms is quickly vanishing for many Red Blooded Americans. …Making it nearly impossible to master accuracy, presentation, left handed and right handed shooting, reloads, dealing with malfunctions, follow through, transitions, lead, stance, acquiring your target, one handed reloads, duck walking, cornering, low light, and the host of other techniques any shooter worth their salt MUST have in a life or death situation. You could go out and read EVERY book ever written on Tactical Firearms Training or spend HOURS interviewing industry insiders, and actually go out in the field and DO this stuff like I have. Read this simple 74 page book that condenses down the most proven and effective Tactical Firearm Training techniques into a quick 2 hour read. How to select the right weapon for your individual hands—There are guns that you will naturally shoot better because of their shape. Pick the wrong gun and you’ll need to fire THOUSANDS of additional rounds to be proficient. How to Train “Unorthodox” Tactical Shooting Techniques: Now you can safely become highly skilled at techniques that you can’t practice at your local range–like drawing and engaging a target from concealment, shooting while moving, moving to cover and firing from behind cover, rolling around on the ground shooting, and other unorthodox shooting positions. How to Legally Train If You Are In A Non-Permissive Jurisdiction (now or in the future): Whether you live somewhere where guns are currently over-regulated or fear that they soon will be, you’ll learn how to maintain and rapidly improve your firearms skills, even in non-permissive jurisdictions. Practice Makes Perfect: You will learn simple steps to program your mind like a super computer so it will react immediately and effectively without doubt or hesitation when it’s forced to perform under extreme stress. 2nd Nature Shooting : You are most accurate when you have to “think” the least and your aim becomes second nature – You will learn a series of exercises that will allow your mind to communicate the exact right sequence of nerve impulses to your muscles…at incredibly rapid speed…so that you can clear your holster, present your firearm, acquire a sight picture, and rapidly engage your target(s) without having to slow down to think about the mechanical process. It’s all in how you hold it : Hollywood glamorizes all these gangster, side stance shooting styles from moving cars that, in the real world, would never hit the mark. But, did you know that there are times when you absolutely, positively DO want your firearm tilted to the side? You’ll learn exactly when you want to do this and exactly how much to tilt your sidearm. When I got serious about getting trained to be able to successfully protect myself and my loved ones with a firearm, I started getting formal training. LOTS of formal training. I trained with SWAT trainers, Green Berets, SEALs, MARSOC Marines—many of whom were fresh back from deployments—and the guys who train these elite units. We’re talking dozens of classes and tens of thousands of dollars spent on education, ammo, and gear. Most importantly, I went beyond simply taking the classes and got into their heads, dug around, and found out the highest of the high speed shooting, training, and teaching techniques that they’d found over the years that had worked for them, both in combat and in rapidly preparing others for combat. Don’t let the size (Just 74 Pages) fool you. This is the distilled product of hundreds of hours of formal training spread out over the last decade. It is truly, the best of the best Tactical Firearms Training information available, and the system is simple and FAST to learn so you can implement this information immediately. *As a bonus, Dustin Ellermann, winner of Top Shot Season 3 loved the book so much that he agreed to help out with it. If you are a fan of Top Shot, you probably enjoyed watching Dustin as much as I did and can imagine how honored I am to have him on the cover of the book and throughout the book demonstrating the skills. Why Spend Your Precious Time Doing The Research When It Is Already Done For You? How much is your time worth? Think about it, why should you go out and duplicate all the time and effort I put into this research? I’ve done the trial and error for you, too. I’m not saying that you shouldn’t go out and get formal training–you should. What I’m saying is that there is a wealth of information in this book that you just can’t fully absorb, apply, and retain from a class. I’ll show you, in this book, how to take the high-speed training that you’ve received (or plan on getting) and effectively lock it into your subconscious mind so that your skills won’t degrade and disappear over time. I’ve pulled together in one simple book the simple steps you can take to improve, hone, and master your technique AND I’ve included the expertise from top experts in the field so you don’t have to retrace my steps. Think You Already Know Guns? So maybe you are already a good shot or been shooting since you were a kid… and that’s great. If you don’t have perfect high-stress shooting technique ingrained in your mind, you’d better pray that you never face a high-stress shooting situation. But, with this training, you can quickly and inexpensively train your mind and body to perform exactly the way you want them to under stress so that you can quickly put multiple, effective rounds on target. Learning the high-speed training techniques (that are nearly free) that elite special operations units use…even though they have virtually unlimited budgets! Knowing that you can confidently engage violent attackers under extreme stress to defend yourself and your loved ones. I’m only charging $7 for this book, and not giving this book away, for 3 reasons. $7 puts the book within reach of the vast majority of people. It’s not too expensive for even the humblest American who wants to protect his family and keep them safe. Anyone who’s not serious enough about their family’s safety, during these incredibly unstable times, to invest $7 into this book isn’t going to take the time to use the methods laid out in the book anyway. With soaring costs to produce and transport products, we opted to make this a download for two reasons. A) You and I save a ton of money and B) You get instant access to this course right now. Anyone who is serious enough to put down the price of a fast food dinner and buy this book has the opportunity to finally gain the peace of mind in knowing that they have taken the steps necessary to safeguard what is most precious to them. So if you’re serious about mastering you shooting skills, and if you would like to start right away! Click the “Add to cart” button below. If you need to justify the expense, skip going to McDonald’s for dinner once this week and it’s paid for. Guarantee #1 If for any reason you think my book isn’t the best $7 you’ve ever spent just send me an email and I’ll gladly refund your whole $7. Never find yourself in a situation where you are not sure of tactical vantage points inside your house when you feel that the security perimeter of your home has been breached. You can either wing it and take your chances, or get this book, otherwise your sure to make GIANT mistakes that could result in death of a loved one. Practice makes perfect and in the “Traditional” training methods, ammo alone puts dependable tactical firearms skills out of the reach of many people’s reach. It doesn’t have to be that way. This TINY $7 book is the only thing standing between you and your best way to ensure your family’s safety. You will save 20 times your initial $7 investment in the first week alone! P.S. Remember, There is more real actionable information in this TINY book than you’ll get reading a dozen books, the systems inside the book has worked for more than 10,000 people just like you, it’s 100% guaranteed so you can’t possibly lose money. It’s a no brainer. If you aren’t blessed with access to unlimited amounts of free ammunition, this book will help you maximize your training time and minimize wasted ammo. The author explains three concepts that will augment your regimen: Dry Fire, Airsoft Practice and Mental Rehearsal. Although I’ve been raised not to dry fire my weapons, the fact of the matter is that most modern guns will tolerate almost limitless dry fire. The author gives you an easy to follow course of training that will improve your technique without sacrificing range safety and discipline. The chapter on Airsoft training gave me another avenue to consider, while the final technique of Utilizing Guided Mental Imagery was probably the best of all; highlighting training elements that you would be wise to implement in everyday life. 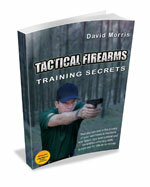 For less than the cost of a box of ammunition you can radically accelerate your firearms training. I really enjoyed this book. For being a shooter that has just a little over a year of trigger time … this book has given me some viable options to train at home. Book was well written and easy to understand. I also like the fact that Dustin was involved from Top Shot. My mom and I supported him while he was on the show and it was nice to see a self taught shooter win. If you are new to shooting this book give you options without having to always go to the range. Weeks before I bought this book I was looking all over the internet for training tips and most deal with going to a range or outdoor range (which in Arizona training outdoors is a nightmare during the summer time 🙂 ). It is well worth buying this book. Hope you enjoy it as I have.